Arabic numerals, also called Hindu-Arabic or Hindu numerals, are the ten digits: 0, 1, 2, 3, 4, 5, 6, 7, 8, 9, based on the Hindu–Arabic numeral system, the most common system for the symbolic representation of numbers in the world today. In this system, a sequence of digits such as "975" is read as a single number, using the position of the digit in the sequence to interpret its value. The symbol for zero is the key to the effectiveness of the system, which was developed by ancient mathematicians in the Indian subcontinent around AD 500. The system was adopted by Arab mathematicians in Baghdad and passed on to the Arabs farther west. There is some evidence to suggest that the numerals in their current form developed from Arabic letters in the Maghreb, the western region of the Arab world. The current form of the numerals developed in North Africa, distinct in form from the Indian and eastern Arabic numerals. It was in the North African city of Bejaia that the Italian scholar Fibonacci first encountered the numerals; his work was crucial in making them known throughout Europe and then further to the Europeans who spread it worldwide. The use of Arabic numerals spread around the world through European trade, books and colonialism. The term Arabic numerals is ambiguous. It most commonly refers to the numerals widely used in Europe and the Americas; to avoid confusion, Unicode calls these European digits. 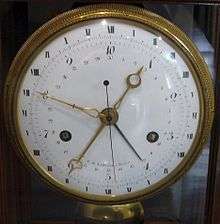 Arabic numerals is also the conventional name for the entire family of related numerals of Arabic and Indian numerals. It may also be intended to mean the numerals used by Arabs, in which case it generally refers to the Eastern Arabic numerals. It would be more appropriate to refer to the Arabic numeral system, where the value of a digit in a number depends on its position. Although the phrase "Arabic numeral" is frequently capitalized, it is sometimes written in lower case: for instance, in its entry in the Oxford English dictionary, which helps to distinguish it from "Arabic numerals" as the East Arabic numerals specific to the Arabs. 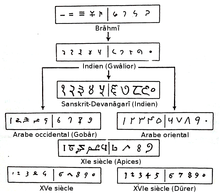 The decimal Hindu-Arabic numeral system was developed in India by AD 700. The development was gradual, spanning several centuries, but the decisive step was probably provided by Brahmagupta's formulation of zero as a number in AD 628. The system was revolutionary by including zero in positional notation, thereby limiting the number of individual digits to ten. It is considered an important milestone in the development of mathematics. One may distinguish between this positional system, which is identical throughout the family, and the precise glyphs used to write the numerals, which varied regionally. The glyphs most commonly used in conjunction with the Latin script since early modern times are 0 1 2 3 4 5 6 7 8 9. The first universally accepted inscription containing the use of the 0 glyph in India is first recorded in the 9th century, in an inscription at Gwalior in Central India dated to 870. 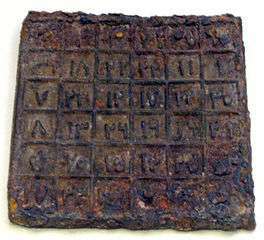 Numerous Indian documents on copper plates exist, with the same symbol for zero in them, dated back as far as the 6th century AD, but their dates are uncertain. Inscriptions in Indonesia and Cambodia dating to AD 683 have also been found. The numeral system came to be known to both the Persian mathematician Al-Khwarizmi, whose book On the Calculation with Hindu Numerals written about 825 in Arabic, and the Arab mathematician Al-Kindi, who wrote four volumes, On the Use of the Indian Numerals (Ketab fi Isti'mal al-'Adad al-Hindi) about 830. Their work was principally responsible for the diffusion of the Indian system of numeration in the Middle East and the West. In the 10th century, Middle-Eastern mathematicians extended the decimal numeral system to include fractions, as recorded in a treatise by Syrian mathematician Abu'l-Hasan al-Uqlidisi in 952–953. The decimal point notation was introduced by Sind ibn Ali, who also wrote the earliest treatise on Arabic numerals. In 825 Al-Khwārizmī wrote a treatise in Arabic, On the Calculation with Hindu Numerals, which survives only as the 12th-century Latin translation, Algoritmi de numero Indorum. Algoritmi, the translator's rendition of the author's name, gave rise to the word algorithm (Latin algorithmus, "calculation method"). "When my father, who had been appointed by his country as public notary in the customs at Bugia acting for the Pisan merchants going there, was in charge, he summoned me to him while I was still a child, and having an eye to usefulness and future convenience, desired me to stay there and receive instruction in the school of accounting. There, when I had been introduced to the art of the Indians' nine symbols through remarkable teaching, knowledge of the art very soon pleased me above all else and I came to understand it." 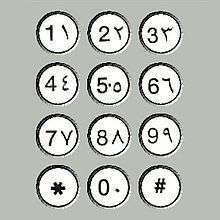 The numerals are arranged with their lowest value digit to the right, with higher value positions added to the left. This arrangement was adopted identically into the numerals as used in Europe. Languages written in the Latin alphabet run from left-to-right, unlike languages written in the Arabic alphabet. Hence, from the point of view of the reader, numerals in Western texts are written with the highest power of the base first whereas numerals in Arabic texts are written with the lowest power of the base first. The reason the digits are more commonly known as "Arabic numerals" in Europe and the Americas is that they were introduced to Europe in the 10th century by Arabic-speakers of North Africa, who were then using the digits from Libya to Morocco. Arabs, on the other hand, call the system "Hindu numerals", referring to their origin in India. This is not to be confused with what the Arabs call the "Hindi numerals", namely the Eastern Arabic numerals (٠‎ - ١‎ - ٢‎ - ٣‎ -٤‎ - ٥‎ - ٦‎ - ٧‎ - ٨‎ - ٩‎) used in the Middle East, or any of the numerals currently used in Indian languages (e.g. Devanagari: ०.१.२.३.४.५.६.७.८.९). The widespread Western Arabic numerals used with the Latin script, in the table below labelled European, descended from the West Arabic numerals developed in al-Andalus (Andalucía, Spain) and the Maghreb. Spanish scholars because of the geographic proximity, trade and constant warfare with the Muslim kingdoms of Southern Spain saw a potential in the simplicity of Arabic numbers, and decided to adopt those symbols, later other Europeans followed and incorporated them too. (There are two typographic styles for rendering European numerals, known as lining figures and text figures). The Arabic–Indic or Eastern Arabic numerals, used with the Arabic script, developed primarily in what is now Iraq. A variant of the Eastern Arabic numerals used in the Persian and Urdu languages is shown as East Arabic-Indic. ↑ Downey, Tika (2004). The History of Zero: Exploring Our Place-Value Number System. p. 22. ISBN 978-0823988693. ; "Fibonacci recognized that the Hindu numerals had many advantages-over the Roman numerals that were then used in Europe. The 4 basic math operations — addition, subtraction, multiplication, and division could all be performed much more easily with Hindu numerals than with Roman Numerals." ↑ Plofker 2009, p. 45. ↑ bigstrand4476 (13 March 2009). "Number Story". Scribd.com. Retrieved 5 August 2011. ↑ O'Connor, J J; Robertson, E F. "The Arabic numeral system". School of Mathematics and Statistics. University of St Andrews. Retrieved 24 July 2015. ↑ Ifrah, Georges. 1999.The Universal History of Numbers: From Prehistory to the Invention of the Computer, Wiley. ISBN 0-471-37568-3. ↑ Meuleman, Johan H. (23 August 2002). Islam in the era of globalization: Muslim attitudes towards modernity and identity. Psychology Press. p. 272. ISBN 978-0-7007-1691-3. Retrieved 3 March 2012. Katz, Victor J. (ed.) (20 July 2007), The Mathematics of Egypt, Mesopotamia, China, India, and Islam: A Sourcebook, Princeton, New Jersey: Princeton University Press, ISBN 0691114854 . Wikimedia Commons has media related to Arabic numerals.